If, like me, you’ve sometimes felt that current grammar rules are just not enough to stop all the ugly grammar that happens online, then you’ll be thrilled to know there’s a second level of grammar. They include Isolation Marks, which are used to ensure your readers know that you’re only quoting bad spelling, and the Demicolon that connects anything and everything, far more advanced than the semi-colon which only connects related yet independent clauses. 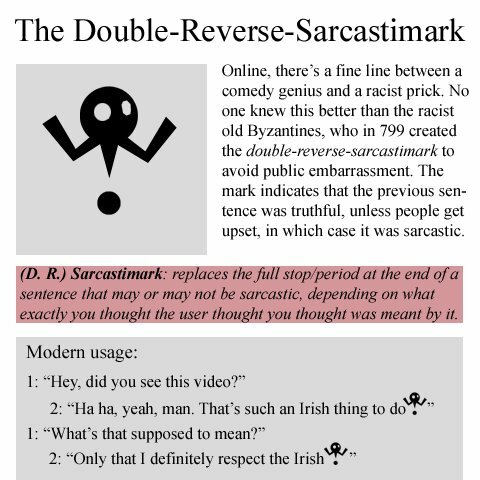 My favorite by far is the Double-Reverse-Sarcastimark. It allows you to correct other people’s grammar sarcastically, and back track if it offends. Genius! To see the rest of the new punctuation, visit College Humor. I need that. I’ve been looking for ages for what I call the “Snark Mark” and I think this is it! WHY YOU HATE THE IRISH????? ?